Friday 28th July 2011: PCC through to a second National Semi-Final! There was high drama on our lawns today when Phyllis Court squeezed past Watford and into the Inter-Club 'Murphy' Shield semi-finals. The match result was in the balance right up to the 12th hoop of the last game and there was a cliffhanger moment still to come. Nick Archer (3) in two tight games, but had to win six hoops in a row to rescue the second. Pam Mead (4) did really well to upset the handicap form and turn the same trick against Janet Lewis (3) but went to the last hoop both times. losing 1-2 to John Walker (3), the game that she did win showed (herself more than anything) that she can indeed compete above her handicap ranking. So at the half way stage the hosts held a slender 2 -1 lead, and as it was a Friday, Fish & Chips beckoned, and very well it went down too. The singles rubbers all followed in the style of the mornings tight games, with Watford's Janet and John getting the better of Phyllis Court's Mary and Pam respectively. Pam's two 6 - 7 reverses being the mirror results of her earlier games showing just how tight these ties were. It looked for all the world the Phyllis Court had the result in the bag as Chris built a comfortable 6 - 2 lead but Ian was not laying down just yet. of the 12th with two balls in front. smiles aplenty all-round, helped no doubt by the traditional afternoon cream tea. Phyllis Court now look forward to meeting Letchworth in the semi-finals. Delia Norris showed 'just what can be done' by winning the very first tournament she has entered today. 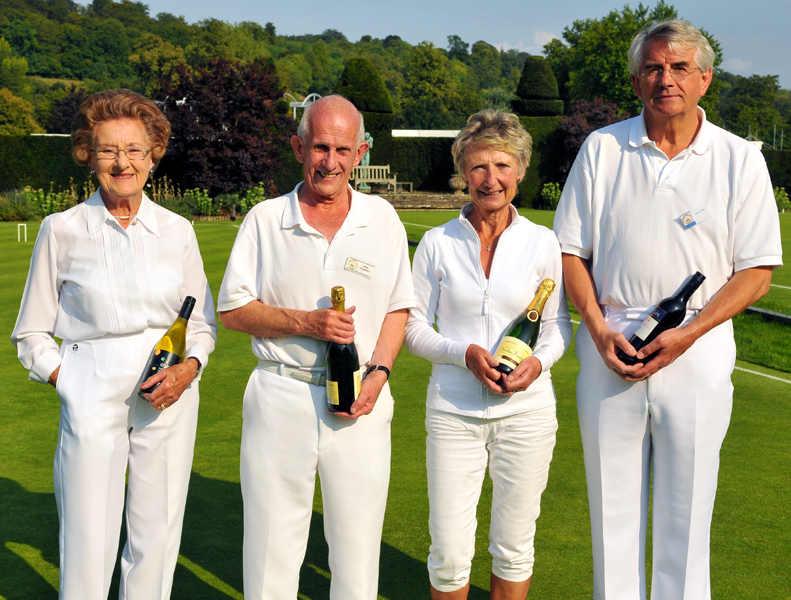 Partnered by the vastly experienced John Chalfont, the pair won all but one of their games to take home the champagne ahead of another newcomer Hugh Crook and his partner Anne Attfield. 32 players with handicaps ranging from 6 to 11, began what turned out to be glorious day, with three rounds of block games. The field was then slipt in half on merit for the knock-out phases with an optional three further games available. With the exception of the finalists, most opted to play just two more rounds but space was found to accomodated three other players who turned up seculativly in the afternoon. Monday 1st August - TJ Wins Veterans Championship and becomes a 'ONE'! Southwick near Brighton under hot sunny skys throughout. The 24 players played in two blocks of 12 with play-offs for positions for all participants, which meant an exhausting 8 hours play per day for 3 days. TJ met 'scratch' player Tom Weston (East Dorset) in the semi-final and beat him impressivly 10-4 in a 19 hoop game and this was probably his best win. The final was not a classic as both TJ and his opponenet Richard Brooks (Sussex Club, HC 2) were exhausted, but our man won in straight games 7-5, 7-6. TJ collecetd The Alan Oldham Memorial Trivet and so that is another trophey with a Phyllis Court name on it! Thursday 4th August - Cave Wolfe washed out again - New date announced! The curse of the Cave Wolfe struck again with torrential rain that flooded three lawns preventing any play at all today. 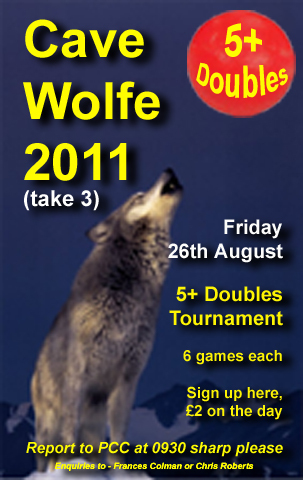 A third attempt to play the tournament will take place on Friday26th August. We host Surbiton in the Inter-Club Championship on Friday 12th August (1030 start) - Surbiton will be bringing some of the Top UK Players to face us - do come and watch! We then travel to Letchworth in the Murphy Shield on Thursday 25th August. PCC Blue chalked up their first win of the season defeating Wingrave decisivly 9 -3 in the SCF Handicap League. Alex Earnshaw was 'Top of the Pops' as he celebrated his late call up, and debut at this level, by winning all his matches. Chris Roberts was an and even later stand in for Don Rutherford and essentially only played because he 'happend to be there', also had a good day with two singels wins that took him from a 2 to 1 handicap somewhat unexpectedly. Other news - This has been a busy week for our internal competitions which are all now getting near the final stages. You can check out the progress of each competition vai the buttons for the Association and Golf pages (see left). Helena Fensome won the 2nd Ripon Womens Doubles Tournament this weekend to reprise her feat of last season. This time with a new partner in Samantha Thompson from the host club, the pair had their toughest match against Freda Vitty and Jane Pringle. A jump shot through hoop 13 in the deciding game from Helena won the tie which was very satisfying because as she reports "jumps are not my strength". The unusual tournament format saw the two pairs matched again in a 19 hoop final which went Helena & Samantha's way 10-7. Doubtless Helena will return north again next season to go for the hat-trick of wins! PCC White eneded their Handicap League campaign with another draw today, this time against the White Horse Club. Only Mary Gaynor won all her games, firstly partnering captain Raymond Wood to two doubles victories and then comfortably defeating her singles opponent 7-3 twice. Surbiton were just too good for us today and we lost 2 - 5. The game was swiched to Surbition's ground less that 24 hours before play due to our waterlogged lawn no.2, which was a real shame. Surbiton had honoured us by fielding a very strong line up that include UK Open Champion and the country's no.3 ranked player Stephen Mulliner and all four of their players are currently ranked in the UK top 40. For us, our Club Champion Charlie Von Schmeider (UK no.22) gave Mulliner a scare taking the first game of three in their singles match, and took another in the Doubles rubber partnered by TJ Johansen. Chris Roberts was our only player to win his matches, both 2-1 satisfying victories against higher ranked opponents. Helena Fensome made up our quartet but lost in straight games this time. Seventy members and partners enjoyed a loveley evening at our annual Summer party this evening and raised a large donation for our chosen charity The Helen Douglas Childrens' Hospice. This morning it was revealed that Frances Colman had indeed won the Association Ladies title and the Orr Plate with a victory over June Robinson last week. There had been some confusion after their competative game about what it counted for, but today it was realised that it was the final of the Orr Plate! So well done Frances who won again this afternnon against Lionel Wilding to reach the final of the Section Tankard. Frances Colman picked up the coverted One Ball 'Tankard Trophy' this morning, beating a field of 12 competitors, playing to handicap rules this season for the first time. Enthusiastic supporter of the One Ball event Ken Cotterell, a twice former Croquet Chairman and a mean Association player in his day, was on hand to present the lovely trophy to Frances who beat Chris Roberts convincingly in the final. Before that, the field was spilt into three blocks of four, all playing all, to provide three winners and a 'best placed runner-up'. Frances, Chris and Michael Wiles won their blocks but the latter then had to withdraw to attend to his bridge Directing duties. 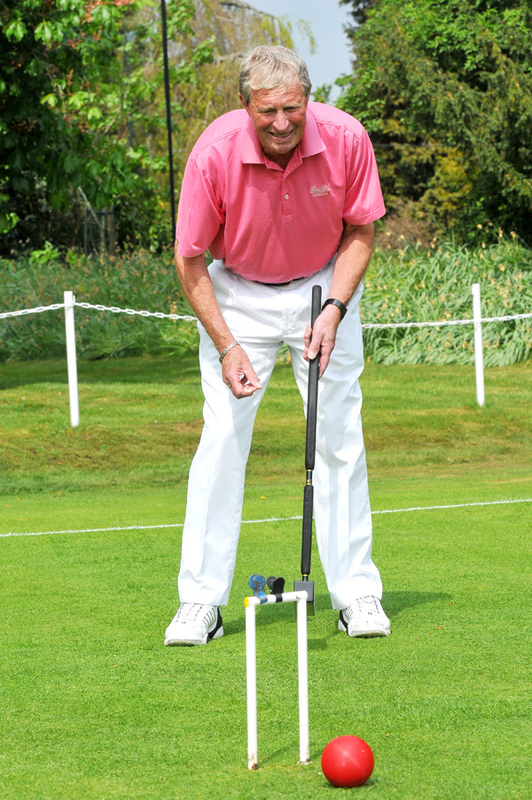 A penalty shoot out between Don Rutherford and Philip Allinson for the single best runner-up spot had been underway before Michael withdrew and in the end both 'shooters' qualified. In the semis, Don couldn't catch Chris who sprinted away early on but Frances had a much tougher ride in conceding four 'extra turn bisques' to Philip and was mightily relieved when he used the last one. Frances won narrowly by two hoops. The Final was close early doors but in the end Frances got away and out manouvered Chris' rear guard attempts. Everyone enjoyed themselves but we could have done with just a little more support (particularly from the Association ranks). Full marks for participation go to tournament newcommers: Margaret Broughton and Julie Till, with the latter especially pleased to pick up a late win on debut. 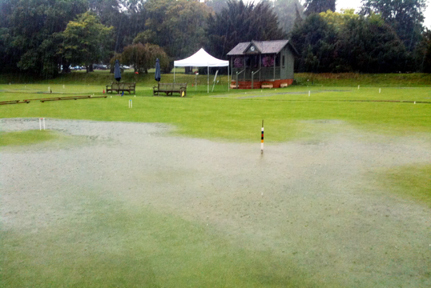 Thursday 18th August - Yet another tournament washed out - BUT NEW DATE IS SET! The Open Doubles 'Iain Lindsay' Tournamet fell foul of the rain today and became the third eevnt day lost to the weather this season. The abandonment was agreed after just one game of a six game programme and a recheduled date of Thursday 8th September was decided. Our Level League team scored a comfortable win over the small and very hosptiable Bransgore Club near Bournmouth today. On a glorious day, which was in marked contrast to yesterday's down pour, PCC lead 6 - 2 after the singes games. Chris Roberts, Frances Colman and Pam Mead all won their two games easily but Helena Fensome came unstuck. After a break for lunch the match concluded with two pairs of doubles games which Roberts and Colman took at a canter but Mead and Fensome had to be content with shared honours, meaning a 9 - 3 scoreleine to conclude the season. 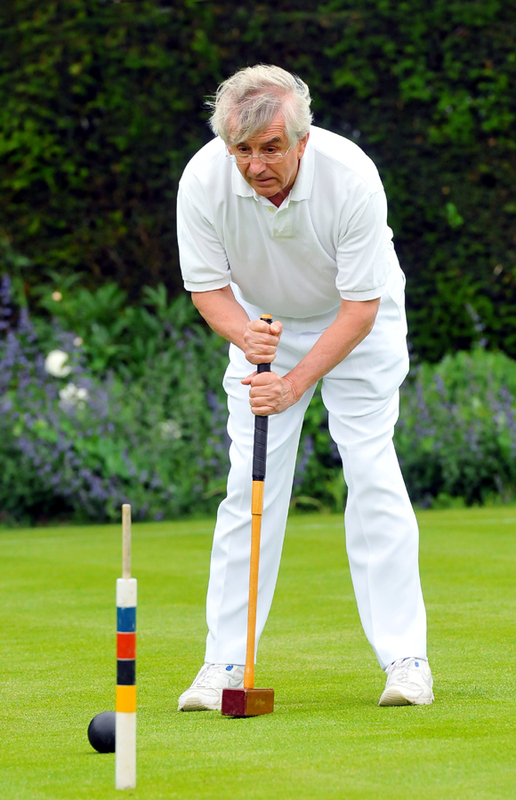 PCC Blue found the rougher lawns of the White Horse club as difficult to contend with as the host's players and they crashed to a 3-9 handiacp league defeat today. Although holding their own in the doubles, John Chalfont's men lost all but one of their singles games with only debutant Ian Norris, who shared his singles one apece, saving our blushes. John, Ian and fellow team members Don Rutherford and Mike Fensome all reported that the tea was vey nice though! PCC Blue have one game left, a home tie v High Wycombe on 2nd September and only a win will see them climb above PCC White in the final league table. Blewbury have won this Northern Area League and will play-off with the Southern Champions Winchester or Ryde. Ian Norris (now a handicap 7) was on song earlier this week and is congratulated for reaching our 7+ Singles Final in his first season in the game. 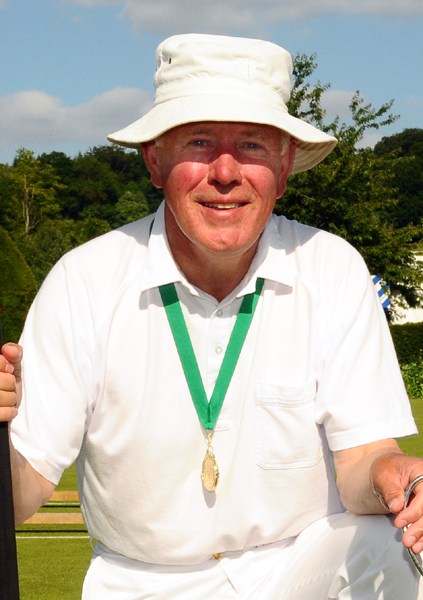 In a tight three game semi final, Ian took his fourth higher handicap scalp of the campaigne in his victory over the fancied 6 handicapper Paul Kerry. Ian awaits the winner of the Dilys Earnshaw v Michael Wiles tie to reveal his final opponent. A two game win by Raymond Wood & TJ Johansen over Vivain Thomson & Helena Fensome this evening took them through to the final of the Open Doubles where Frances Colman & Chris Roberts await having dispatched the spirtied 'master and aprentice' pairing of Charlie von Schmeider & Bob de Board. By the narrowest of margins our Inter-Club 'Murphy Shield' team bowed out of this National competition at Letchworth today. The 3 - 4 scoreline told the tale of a very close fought affair with the match result in doubt until the last five minutes. Letchworth held a slim 2 - 1 lead at half time thanks to two singles victories verses PCC's success in the doubles thanks to Helena Fensome & Frances Colman's partnership. So we needed to win three out of the four of the singles rubbers in the afternoon and things took a turn for the worse when Helena went down 0-2 in her match. 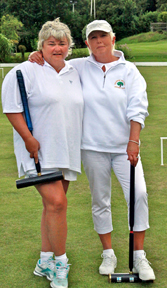 Pam Mead was next to finish and she recovered well from two narrow defeats in the morning, to re-addresse the ballence with a pair of straight game wins, leaving Raymond Wood and Frances having to win in matches that both went to a third and deciding game. The tide turned against Raymond when he all but peeled his opponent through hoop 11 and the match was over just before Frances cooley out manovered her man to secure a win in her match on the last hoop of a mamouth 38 hoop encounter. So as PCC lucked-out at this the semi-final stage (one round better than last year), Letchworth go forward to play Bordwas (Worcester) in the National Final. Friday 26th August - Third wash-out for Cave Wolfe - It's just not fair! Unbelievably our Cave Wolfe Tournament was washed out for a THIRD TIME today. There is now no more time left in the congested end of our season, that we can possibly re-schedule yet again. Thank you to all members who have entered on one of more of the aborted dates - you support is greatly apreciated. There are still a couple of places left for THE IAN LINDSAY TOUNAMENT, now being held on 8th September. Sign-up in the pavilion now! And the same goes for the Autumn Drawn Partners Tournament on 15th September. Hugh Crook (far left) joined fellow competition debutant Ian Norris in a final line-up on Monday morning when, together with partner John Chalfont, the pair reached the final of the 5+ Doubles at the expence of Dilys and Alex Earnshaw. They now know their final opponents will be the Raymond Wood (center left) & Vivian Thomson duo, who defeated the 'Tennis Stars' pairing of Mike Fensome & John Stanner on Wednesday evening. Yesterday Raymond Wood defeated Rosie Richardson to earn his now regular place in the 5+ Singles final, and this will be Raymond's fourth appearence in this final in the last five years but he is yet to win it - Mike Fensome (near Left) stands in his way this time round. Raymond features in a hat-trick of three finals appearences with the Open Doubles compleing his set. Looking back to the Bank Holiday, Chris Roberts was given a very tough ride by Helena Fensome before winning through in the Open Singles to set up a repeat of last season's final against Club Champion Charlie von Schmeider. Association: Final line-ups are begining to take shape. 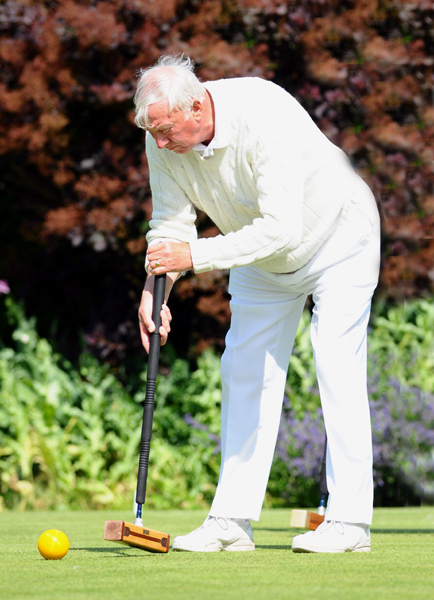 New member this season Harry Midgley and golf convert Michael Wiles have qualified in the K-O Doubles, while Keith Noble has quietly booked his place in two finals.